Check the links below to products and articles of interest. We'd love to hear from you so do get in touch via twitter & facebook! The Porlex Mini Stainless Steel is ideal for grinding coffee beans for one or two cups at a time. It is a sturdy attractive device, and compact - so not taking up too much space in your kitchen or your desk drawer at work. The Porlex grinders have ceramic burrs and are renowned for their ease of use and quality. 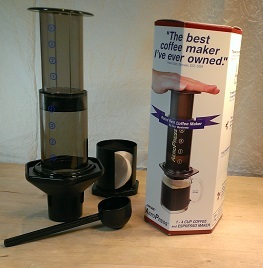 The Porlex Mini can fit snugly into the upper chamber of an AeroPress coffee maker. So pop the beans in the top of the Porlex, the Porlex into the AeroPress, take the Tiamo Flask with you and you have all you need to enjoy excellent coffee wherever you go. Grind the beans in situ for fresher coffee, pour the water through, and press. There's a bigger brother too - the Porlex Tall Stainless Steel coffee grinder is essentially the same device but not surprisingly taller, and with a little more capacity for coffee. It is also just the right diameter to be able to be fitted inside the AeroPress chamber. The Porlex Mini comes with a rubber holder which the handle can be placed through to keep it all together. The Drip-In Server from Hario is a great combination item - it is a drip filter coffee maker, it is a coffee server too - stylishly serving up your favourite beverage! 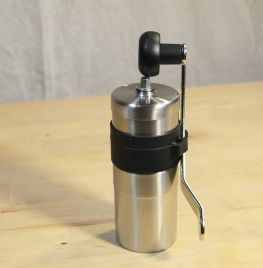 You can also use it for Cold Brew coffee. If you've heard of the lovely classic Chemex pour-over coffee maker, we think of this as a value version - but it's still quality as it's made by Hario and has good pedigree as part of the V60 family of products. As a glass serving jug with cup measures on the side, the Hario Drip-In Server looks good and sits well on a coffee or dining table. 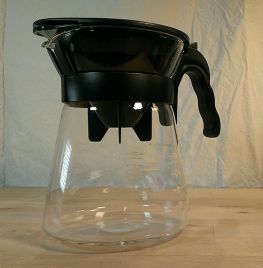 This device can also make your coffee too - using the drip-filter method with ground coffee placed in V60 filters, of 02 size, in a plastic removable V60 frame which rests on the top of the glass server jug. Hot water is then poured-over the coffee grounds at a slow pace - first allowing the coffee to swell (or bloom) and then refilling the V60 frame and allowing the coffee to slowly drip through. A plastic lid helps the brewing process and a stylish black handle robustly adorns the side of the server. 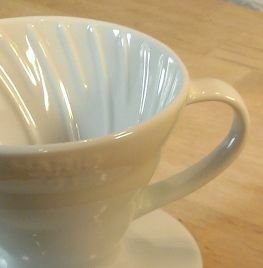 The Hario Drip-In Server is also great for pour-over-ice coffee making - to the process described above but with ice already placed in the jug - which the coffee pours over, cooling as it goes. This device from the Hario V60 family is a really versatile coffee maker. You can also find it featured as a key part of The Drip Filter Kit. The AeroPress is an amazing coffee maker - if you're used to instant coffee the AeroPress will be an eye opener, as it barely takes more time than making instant coffee, yet tastes many, many, many times better! The AeroPress is essentially two plastic tubes that fit together - one that you put the coffee and water into, and one that you use to push the water under pressure through the coffee. So the AeroPress creates the ability to get close to an espresso coffee with a simple, easy to use, portable, coffee-maker which is almost self-cleaning too. The AeroPress is a great coffee maker and can fit with a very outdoors based life, as it's so portable. It can be used on holiday, at the beach, on picnics, at work, as well as in the kitchen or at home. There are increasingly opportunities to have your coffee shop coffee made with an AeroPress too. Many baristas do take this product really seriously - and World AeroPress Championships take place every year! To be fair, most of our products are favourite in some way or other - we love handbrew coffee techniques and like to keep trying all the different methods we can get our hands on. One of the simple, relaxing, first ways that we embraced handbrew coffee was with the Hario V60 - it's a ceramic conical device that sits atop a mug or jug. Into it you place a paper filter (which you can wet to remove any paper taste that you might otherwise detect). Into the paper filter you place ground coffee to a medium coarse grind. Simply pour a small amount (perhaps 40g) of hot water onto the coffee grounds and let them swell, or 'bloom' for half a minute or so. This gives the coffee grounds the chance to wet through and ensures more coffee flavour is extracted. Then in slow swirls continue pouring water onto the coffee and allow it to drip through to the mug or vessel below - take your time in this and enjoy the process. You'll achieve a more delicate flavour of coffee and slow down a little while you're at it! . 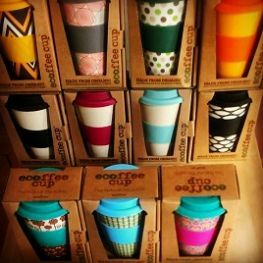 The waste generated by disposable coffee cups has been highlighted in the news in recent weeks - there is a real concern that the daily disposable coffee cups that many people thought were genuinely recyclable are in all practical terms NOT. You can do something about this though, by having your own reusable cup and asking for it to be filled at your favourite coffee shop. This is a big environmental concern so lots of people taking this important step will help - and many coffee shops will give some money off, or a donation to charity out of the price of your coffee. 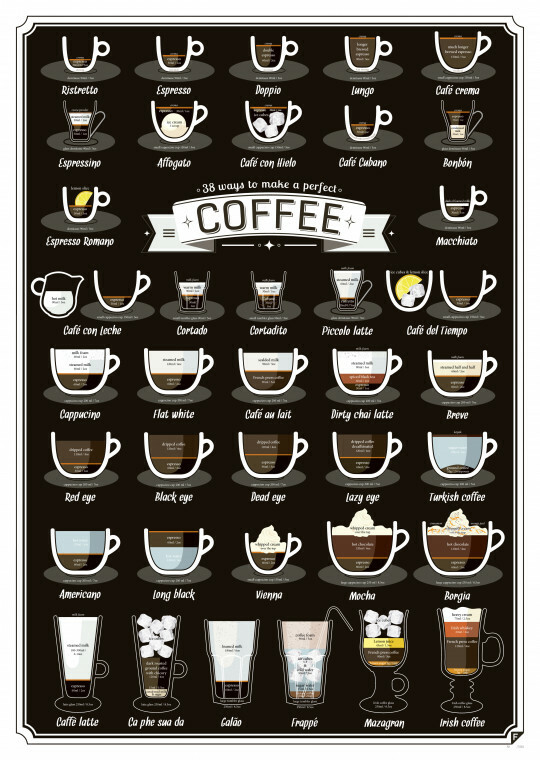 There are lots of options for you to use - you may already have a suitable cup. But if not, we have some great designs of ecoffee cup for you to consider - so we thought we'd highlight some of the 25 designs of ecoffee cup that we stock. 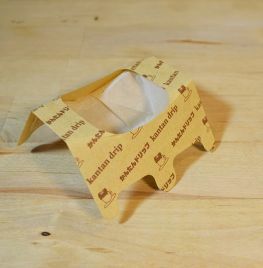 instead of paper filters if you'd prefer. 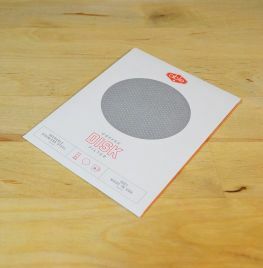 The Able coffee disk filter is designed to fit directly in the AeroPress. Do you ever go a way for a few days and get really disappointed with the quality of coffee that you can make for yourself to start your day? Our new stock of Kalita Kantan single cup filters could provide an answer! 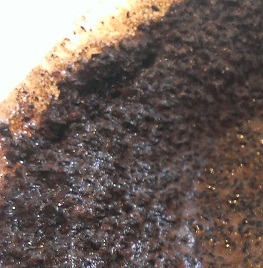 scoop some ground coffee into the filter area and pour water slowly through the coffee grounds. They will fit most mugs, but not the very largest. Simple, quick and compact. One of our favourite products is the AeroPress. ....without crazily expensive and complicated machines. Here's the story of the link of the AeroPress and the Frisbee. Visit Artistry Coffee's morning coffee board on Pinterest. Could coffee be one of the most useful items on the planet? After the bean and the grind could the coffee grounds be of any use? Follow Artistry Coffee's board Coffee notes on Pinterest. A range of coffee based accessories. Buy filter coffee in a convenient pack-size. Order coffee beans, perhaps try something new. Get the satisfaction of grinding your own coffee beans. Craft Delicious Coffee at Home !